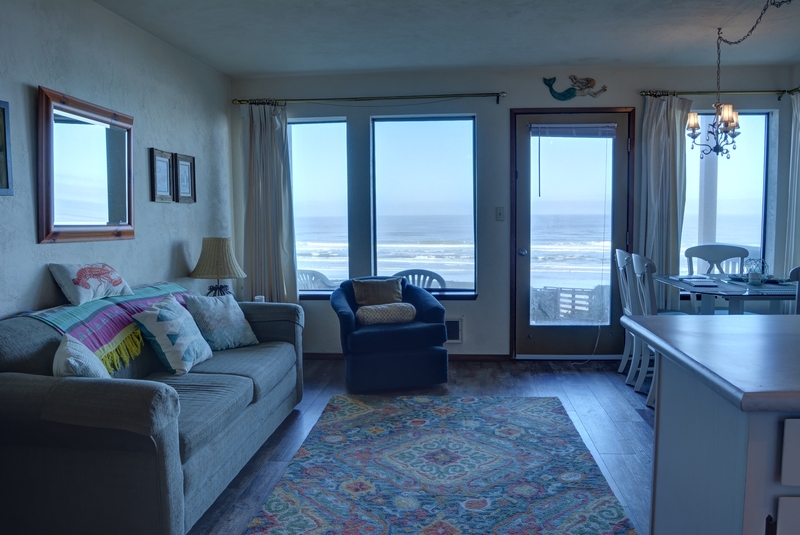 Little Bit O' Heaven are the very words that guests have used to describe their stay at this ground level, ocean front condo located in the historical Nye Beach area of Newport. 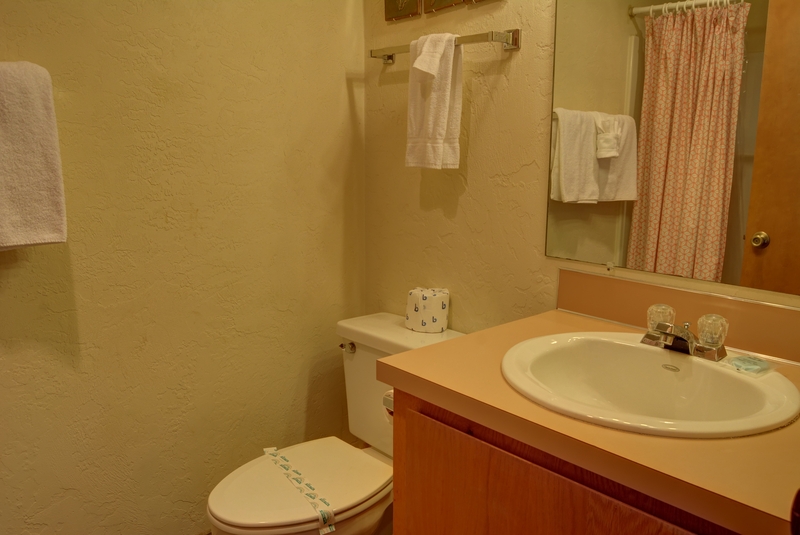 This one bedroom, two bath condo accommodates up to four people. 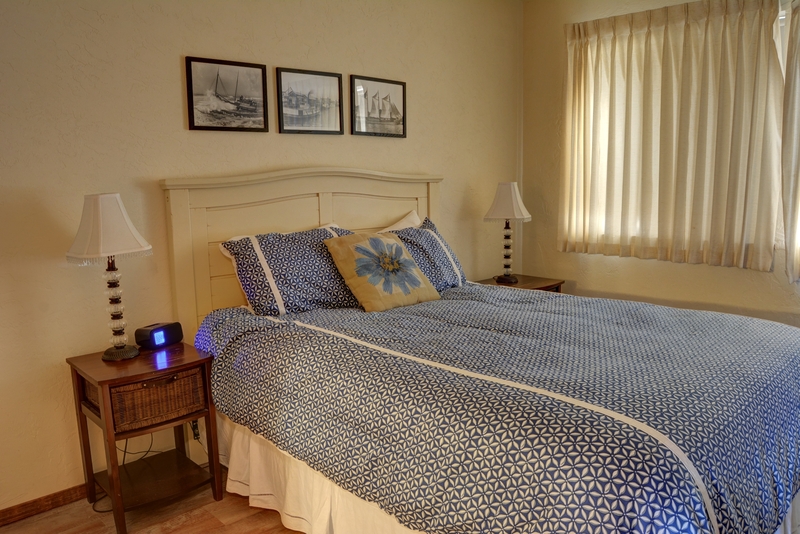 The master suite with a queen bed offers a full bathroom, while the guest bath is located in the hallway. There is also a sofa sleeper available for guest use. 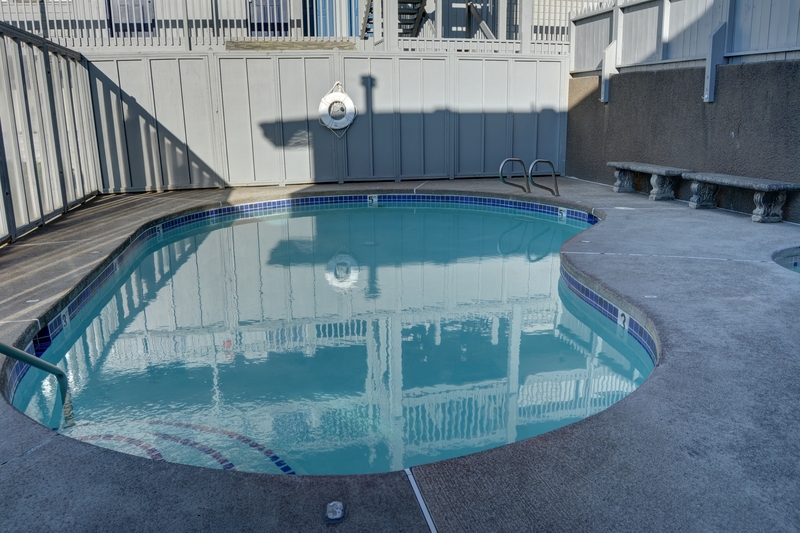 The condo complex has a pool in the common area for guest use during the summer season. At this vacation home, you are in the perfect location to walk to the art shops, gift shops, cafes, restaurants, wine tasting, art galleries, and the Newport Performing Arts Center. 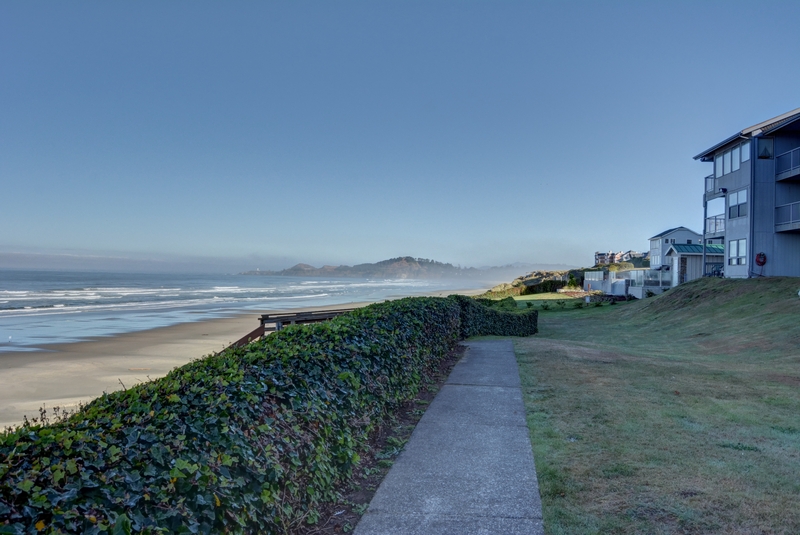 With beach access down a flight of stairs right behind the condo complex, getting onto the beach has never been easier. If you'd prefer not to climb the stairs, there is an easier way down to the beach via the public access, just a few blocks south of the condo. You're also a short ten minute drive from the Oregon Coast Aquarium and the Hatfield Marine Science Center. Come down to the Oregon coast today with Oregon Beach Vacations! "What a wonderful place. The location was perfect and the property was comfortable. 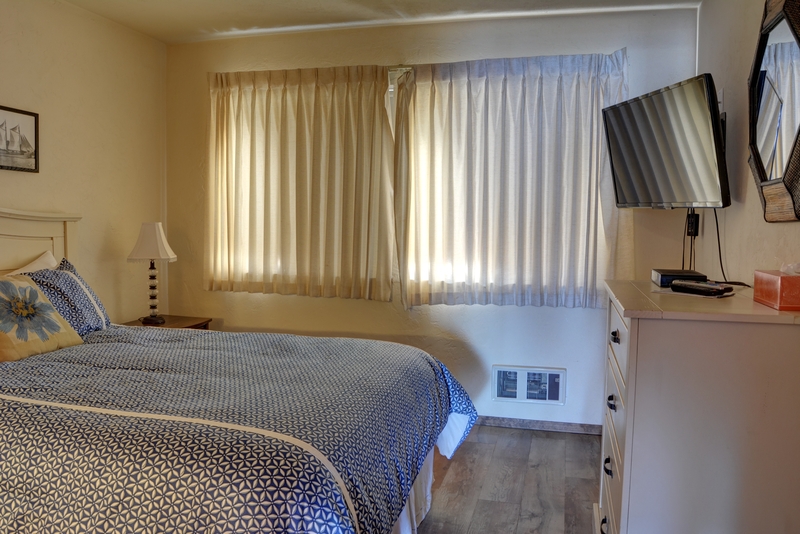 We will definitely be returning to this relaxing oasis ;-)If I had a quibble, it would be the power outlets in the unit are very loose and scary (plugging in my laptop turned off a lamp in the living room!)" "Hello Roy, Thank you for your review. We are happy to hear that you enjoyed your stay at Little Bit O'Heaven. We hope that you will be back again soon! As for the outlets, we will notify maintenance to have these looked at immediately for safety! Thank you for bringing it to our attention. Thank you again for your review!" 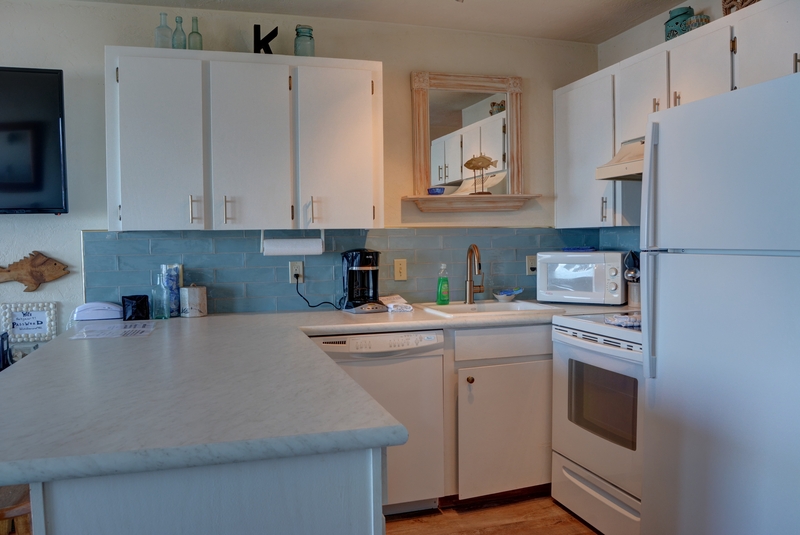 "We have stayed at this condo twice in the last year and like it for location and convenience to get to the beach and things to see and do. This time we brought our granddaughter and the the hide-a-bed worked out great for her. Let me say their are a few detail items that need attention. Namely, part of the outlets in the living room and dining area do not work which is frustrating in trying to charge the electronics we all use and depend on. " "Hello Thomas, Thank you for your review. We are glad to hear that you enjoyed your stay at Little Bit O'Heaven with your granddaughter. We are sorry to hear that some of the outlets were not working during your stay. It looks like at least one of these outlets were fixed after your stay. We hope to have you stay with us again in the future." 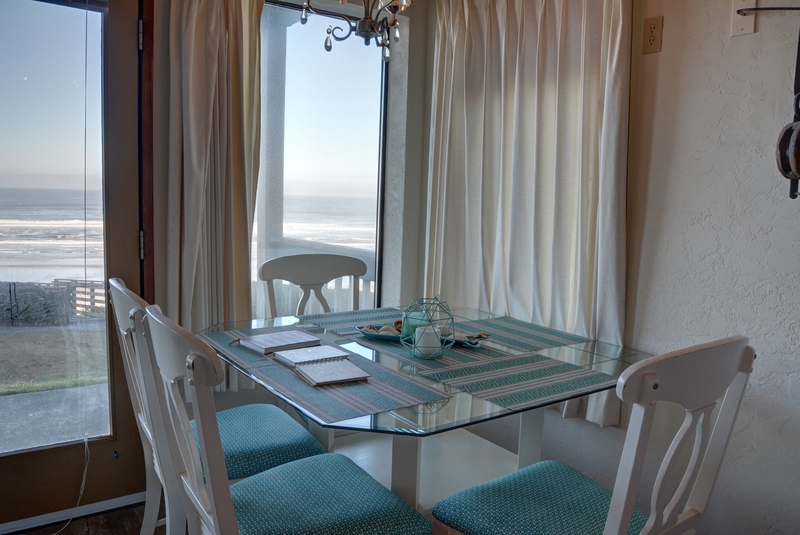 "The location was within walking distance to both beach just down the stairs from the back door and also to Nye Beach for food and shopping. The curtains were dated and broken and the back door needs better locks for security and the sofa was older and too soft. The kitchen was well equipped to cook in and this time of year it was quiet." "Hello Elaine, Thank you for your review. We are glad to hear that you enjoyed your stay at Little Bit O'Heaven. We are sorry to hear that you ran into a few issues with the home. We will look into getting these repaired. Thank you for bringing them to our attention. We hope to have you stay with us again in the future. Thank you again for your review." "We much enjoyed our stay. The closet doors were non functioning upon our return, and some we 40 would be helpful in the back lock." "Hello Eric, Thank you for your review. We are glad to hear that you enjoyed your stay at Little Bit O'Heaven. We hope to have you stay with us again in the future." "Loved this condo! Close to the beach, very clean and nice!" "Hello Kate, Thank you for your review. We are glad to hear that you enjoyed your stay at Little Bit O'Heaven. We hope to have you stay with us again in the future." "Susan, thank you for taking the time to send in your review of your recent visit to Little Bit O' Heaven. We are pleased to hear you enjoyed your visit with the exception of noisy guests passing by your bedroom area and loud, showing no respect. We do hope you and your husband made memories that will be talked about for years to come and can be shared with friends and family alike. Once again Susan, thank you and for your next coastal getaway Oregon Beach Vacations would enjoy hearing from you to assist in planning that trip." Just as listed!!!! Loved it!!! "View was amazing!!! You can open the backdoor and walk right out to the beach. Bed is comforty! Very nicely remodeled." "Hello April, Thank you for your review. We are happy to hear that you enjoyed every bit of your stay at Little Bit O'Heaven! We hope to see you again soon on the Oregon coast. Thank you again for your review!" "Hello Rachel, Thank you for your review. We are very happy to hear that you enjoyed your stay at Little Bit O'Heaven and we can't wait to accommodate you again in the near future! Thank you again for your review!" "Hello Kathlyn, Thank you for your review. We are so happy to hear that you enjoyed your stay at Little Bit O'Heaven! Thank you for recommending this home to your friend! 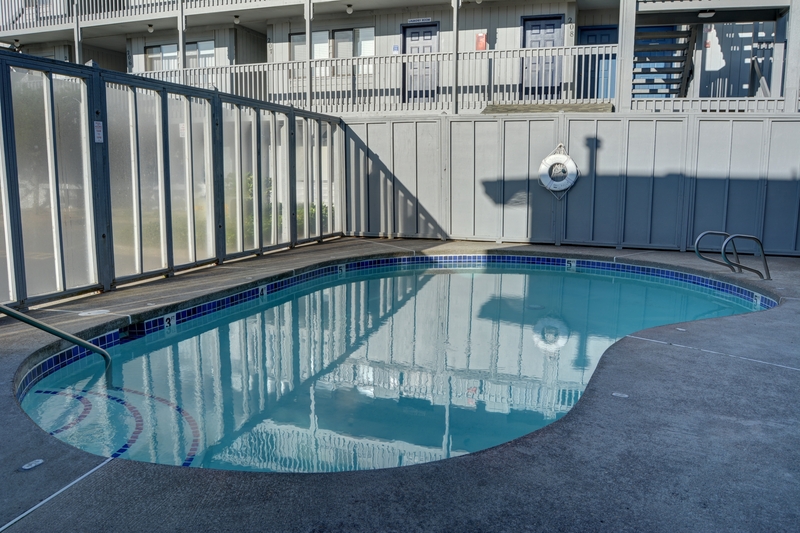 We can't wait to accommodate you on your next visit to the Oregon coast! Thank you again for your review." Loved my stay at Little Bit of Heaven! "Loved my stay at Little Bit of Heaven! Good bed, wonderful view from living room and kitchen, very peaceful setting. Easy in and out, nice amenities, though the addition of WiFi would greatly improve this rental! Thank you. " "Was very beautiful view and close to ocean. Clean and modern. Only disappointed hot tub wasn't working was looking forward to that. Overall I would recommend rental to anyone." "Hello Shawn, Thank you for your review. We are glad to hear that you had a wonderful visit to Little Bit O'Heaven. We are sorry to hear that you were not able to use the hot tub during your stay. 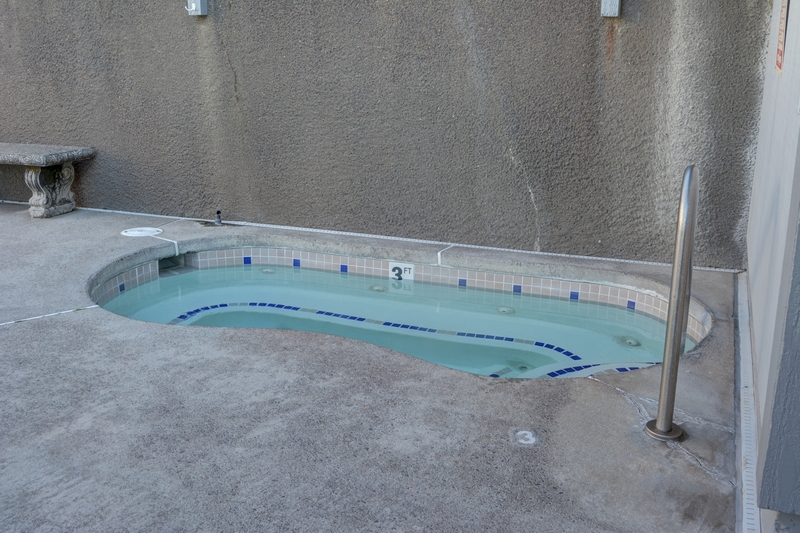 The condo complex did not inform us that the hot tub was down so we were not able to let our guests know prior to their stay. We apologize for this inconvenience. We hope to have you stay with us again in the future. " "This is a cheerful, bright apartment with an amazing location. The beach is beautiful, 2 miles of pristine sand with bright sunsets. One block from a cute little beach village with coffee shops and wine stores.Management was very helpful and very responsive. I would definitely recommend this place a beach getaway." "Hello Susan, Thank you for your review. We are glad to hear that you enjoyed your stay at Little Bit O'Heaven! We are happy to know that our office staff was able to assist with any issues you may have encountered during your stay. We hope to have you stay with us again soon." "Hello Beth, Thank you for your review. 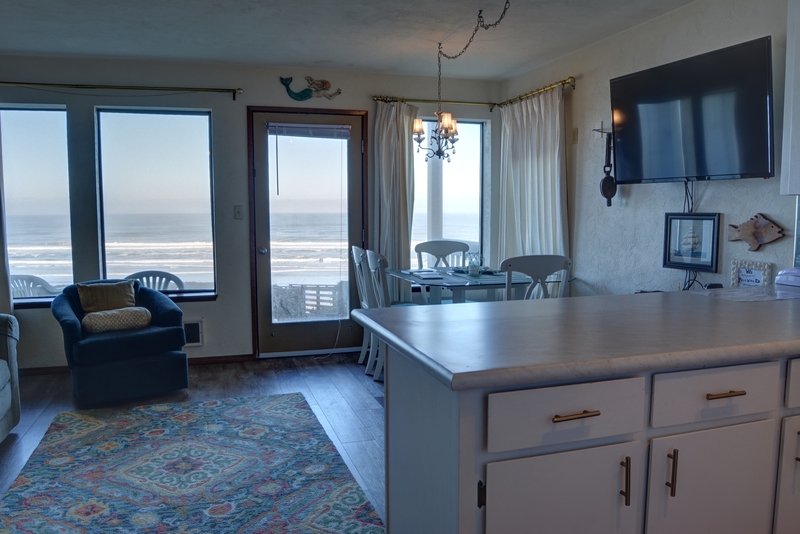 We are glad to hear that you enjoyed both your first and second stay at Little Bit O'Heaven, and we can't wait to see you again on the Oregon coast for a third visit with us! Thank you again for your review!" "I only have 3 issues, 1. wish there would have been a key to the back door 2. The bedroom needs darkening drapes, it was like daylight all night.3. The furniture was stained and looked like it needed cleaned or replaced.Everything else was very nice. Great view for sure. Would go back if bedroom gets new shades." "Hello Carrie, Thank you for your review. We are glad to see that you enjoyed your stay at Little Bit O'Heaven. We are sorry that you experienced a few issues with the home, but we are glad it didn't take away from you overall stay too much. We will take these suggestions into consideration. Thank you for bringing them to our attention. We hope to have you stay with us again soon on the Oregon coast. Thank you again for your review." 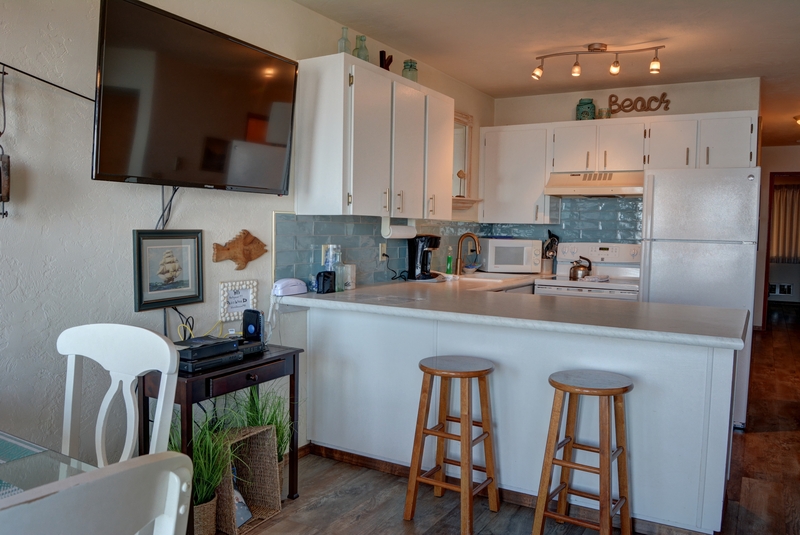 "We were so thrilled to see the view and beach access from the condo!The place is decorated sweetly and has a wonderful beachy feel.The bed is super comfy too, and bathrooms were nice and clean.We have a couple of things that disappointed, the hot tub is broken and has cones around it. I wish there was something in the post about how it was unusable, our kids were bummed.Secondly the smell in the condo! It hits you when you walk in. My 11 year old said it smelled like a musty old man. I don’t know if the place has moisture issues or what but it was bad. And the windows facing the ocean don’t open so our only chance for airing out was the back door. Overall we had a great time, I hope the stink is addressed at some point. And the hot tub too. I think if those two things were fixed we would stay again." "Hello Tiffany, Thank you for your review. We are glad to see that you enjoyed your stay at Little Bit O'Heaven. 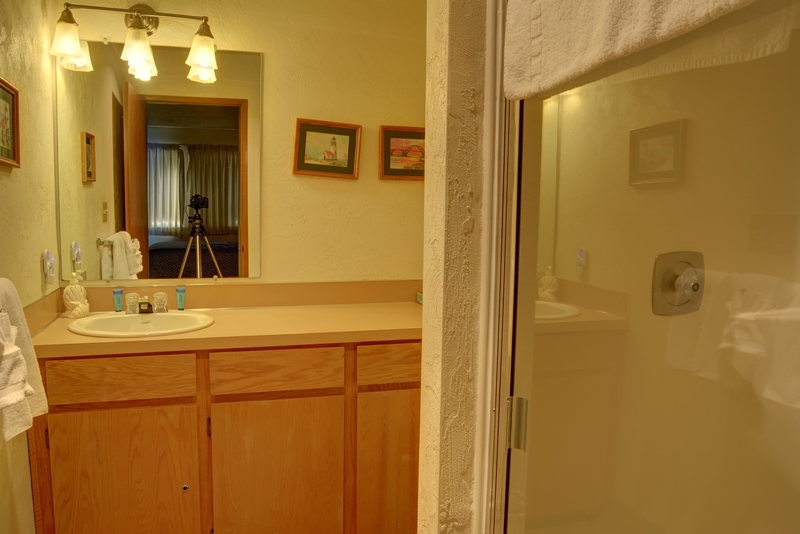 It sounds like this unit was perfect for you and your family. We are sorry to hear that the hot tub was not working during your stay. Unfortunately, this is not something that we have any control over, but rather something the condo complex is responsible for. The condo complexes do not always let us know when something is down. We apologize for this inconvenience. As for the smell, we can put in a work order to bring in Ozone machines. Thank you for bringing these items to our attention. We hope to have you stay with us again in the future. Thank you again for your review." "Hello Julianna, Thank you for your review. We are so happy to hear that you loved your stay at Little Bit O'Heaven! We hope this mean we'll see you again soon on your next Oregon coast vacation! Thank you again for your review!" "We really enjoyed our stay. Don't be fooled that you need to download an app to get into your unit. Owner sent all the information we needed. It would be helpful to have a light at the front door so you can see to do the key code"
"Hello Becky, Thank you for your review. We are happy to hear that you enjoyed your stay at Little Bit O'Heaven. The app is a great tool, not just for getting into your rental unit, but for finding awesome things to do in the area you're staying, along with directions and phone numbers to these restaurants and locations. We will see if other customers have had issues with the lack of a porch light and notify the owner about it if it's a common concern. We hope to see you again soon, and thank you again for your review!" "The only outlet in the master bathroom did not work. It was reported so hope the next guest does not have that problem. We enjoyed our stay there in spite of that inconvenience and loved the view. Found the seating not very comfortable but we still found much to like." "Hello Sammie, Thank you for your review. We are happy to hear that you enjoyed your stay at Little Bit O'Heaven. The outlet has since been fixed, so thank you for bringing it to our attention. As for the seating not being to your liking, we will look into this and if other guests feel the same way, we will let the owner know and they can proceed from there. Otherwise, we hope you had a wonderful time overall, and we hope to see you again soon on the Oregon coast. Thank you again for your review. " "Hello Niki, Thank you for your review. We are happy to hear that you enjoyed your stay at Little Bit O'Heaven! We hope that you'll be back again soon! Thank you again for your review!" "My wife stayed for a week at the property and had a great time. We used it to have a good view of the beach and as a base for exploring the area. As the pictures show, it is right on the beach. You can sit back and enjoy the sunsets. It is approx 115 steps down the stairs to the beach and about two blocks from restaurants, coffee shops, fudge, gifts, and the local art association. The condo was very clean and quiet. The bed was ok - a bit older and on the soft side. I'm a side-sleeper so that was fine for me. The only suggestions for improvement I could make be a new couch and chair in the living space. They are showing their age and a bit uncomfortable. Some better chairs on the back porch would be an improvement as well. Overall a good value for the money and a great location." "Hello Thomas, Thank you for your review. We are glad to hear that you enjoyed your overall stay at Little Bit O'Heaven. We will look into the possibility of getting some of these items replaced if other guests have the same concern. Thank you for bringing these items to our attention. We hope to have you stay with us again in the future. Thank you again for your review." 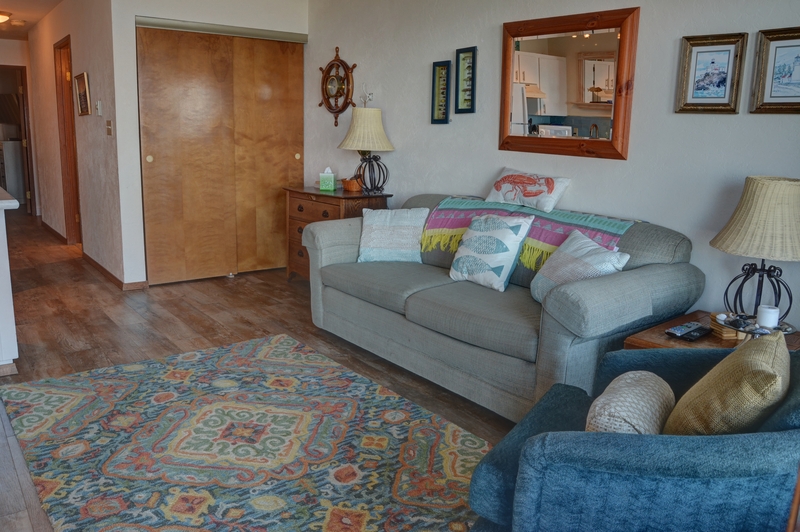 "This is a lovely, older condo with full ocean front and lovely views of the beach and Yaquina Head. We found it very comfortable and it provided everything we needed. Feels a bit like Grandma's house. I've read the couch was uncomfortable - we found it was fine, but the stuffed chair needs support. A pillow fixed the problem. The outside plastic chairs were clean, but didn't look it, and we enjoyed watching whales while sitting out there. Didn't use the TV, so can't comment on that but the wifi worked great. We'll rent it again!" "Hello Debbie, Thank you for your review. We are glad to hear that you enjoyed your stay at Little Bit O'Heaven. We are happy that the condo was comfortable overall and that you were able to enjoy the beautiful views. We look forward to having you stay with us again in the future." 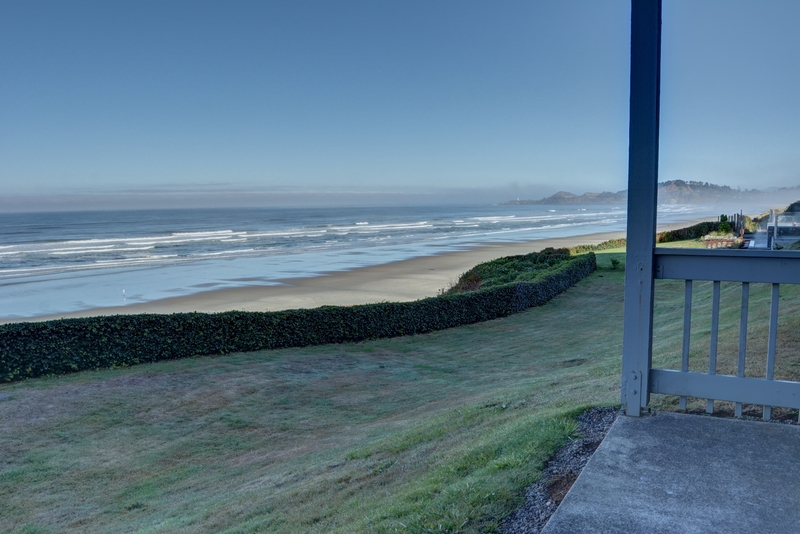 "A perfect location on Nye Beach with miles of Sandy Beach being pounded by enormous waves. What could be better? It would have been better if the Curtains had opened and closed without me having to stand on a chair, and hook several of the pins back in the pull rings. I would have been much better on a stormy weekend had their been written instructions on how to operate the T.V. with its three Remote Controls, and a binder with multiple pictures of Remote controls but none of the three that we were supposed to operate a 60 inch T.V. with. A call to the Oregon Beach Vacations Office got us a promise of someone coming between 8 and 5 the next day to check on it. Which meant we had to wait until he had shown us how to use first one then the other to get any channels to come in. Extremely complicated, and a try to change channels after the Service Man had left, left us staring at the giant screen with the "No Service" box in the middle! We enjoyed a weekend in spite of not having any T.V. but would strongly suggest a detailed written Instruction Sheet be there for old folks like us that were not born with a Remote in each hand. Thank goodness we had brought our Kindles along. However, the lighting is more conducive to watching T.V. than reading books, but we managed. All in is a great location for shops, restaurants, an amazing beach, and a potentially wonderful place to spend a weekend. Rain or Shine "
"The property was nice and the view was amazing. If your at the coast during rough or wet weather and watching the ocean from inside - it't the most comfortable. My only complaint is that the furniture is really old, worn and terribly uncomfortable. The curtains are shaggy and old and falling down in the bedroom which just made the place feel sub-par. I've staying in nicer for the money. This is also not a place for anyone who can't manage 117 stairs up and down to the beach! Oh, and no coffee so you have to bring your own. I thought that was odd. " "Hello Stacey, Thank you for your review. We are glad that you had a nice stay at Little Bit O'Heaven. We are sorry to hear that you weren't happy about some of the furniture in the rental and we can certainly look into this to see if others have similar complaints. We do not provide coffee in any of our rentals and are sorry if you heard or were told otherwise. We provide a small starter pack for all our guests, which includes towels, shampoo and conditioner, kitchen supplies, toilet paper and paper towels, but unfortunately coffee is not one of these items. 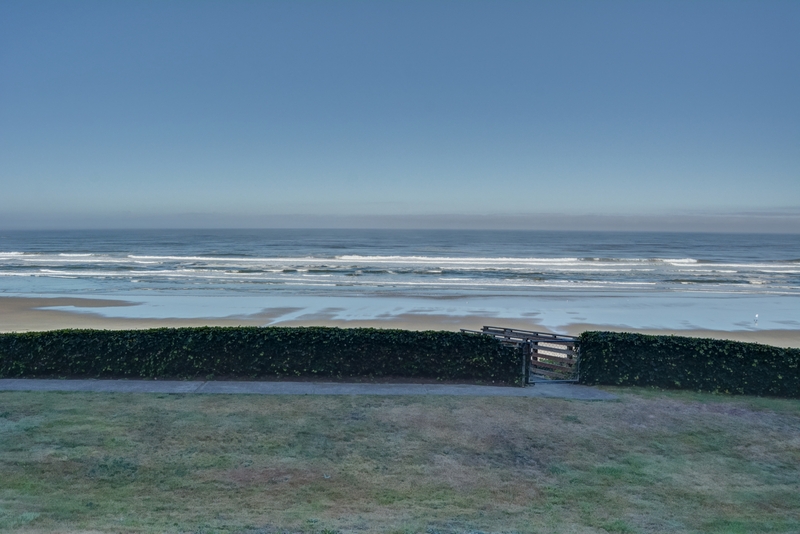 We hope you had an otherwise great stay and hope to see you again soon on the Oregon coast. Thank you again for your review."